I recently made my first trip to the United Kingdom and believe it or not I didn’t get to see anything of London with the exception of my last night in England before heading off to California. 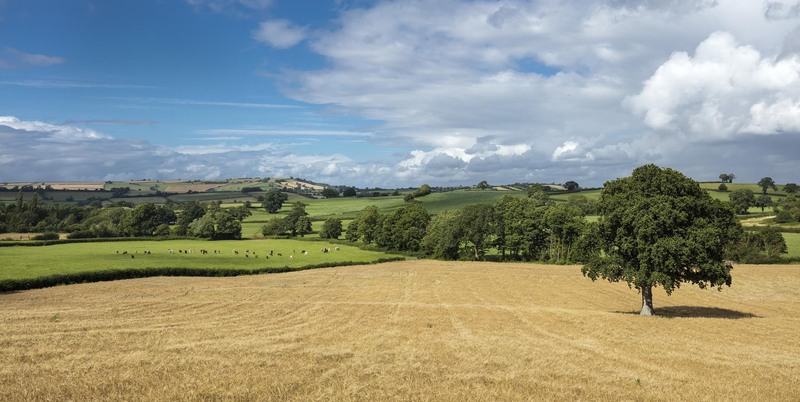 My assignments focused on the English Countryside where I met up with beef, sheep and pork producers as well as dairy farmers and cheese makers whom I will post about in the near future. For this feature I will concentrate on the meat side of things. Upon arrival at Heathrow International Airport I immediately headed straight for the car rental lot where they put me in a six-speed manual shift VW Passat. It was a bit nerve-racking trying to adjust to both driving on the right-side of the vehicle while shifting with my left hand. Lots of new synapses had to be developed in a short period of time. After picking up my colleague, Mamie Chen, at a nearby hotel we set out on our mission. I soon found I had a new challenge in England and that was to learn to navigate narrow country roads which were at times only one lane wide. The worst thing was when I had to stop suddenly and quickly shift into reverse to get out of the way of a big truck. The one thing I have to say about English drivers is that they have the best etiquette of any drivers I’ve ever known. Or perhaps they sensed I was a maniac on the road so gave me a wide berth. Our first stop was to visit Langley Chase Organic Farm where we met up with Jane Kallaway and her flock of Manx Loaghtan sheep. 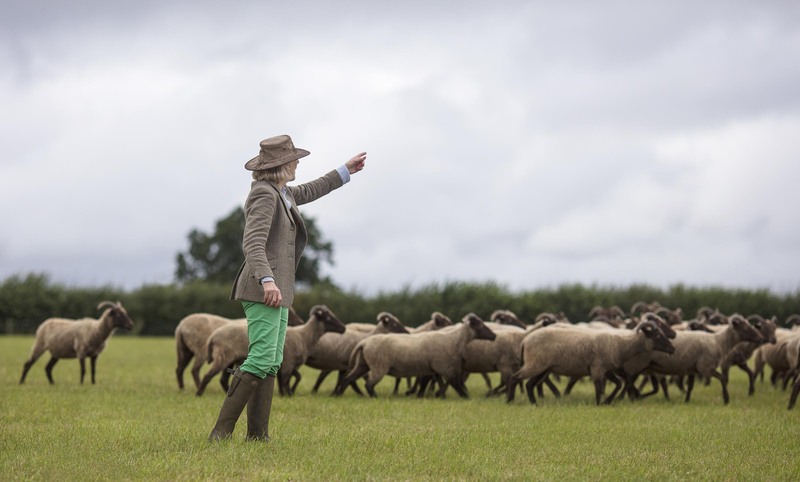 Jane Kallaway directs her dog, Flute, on where to run her sheep. 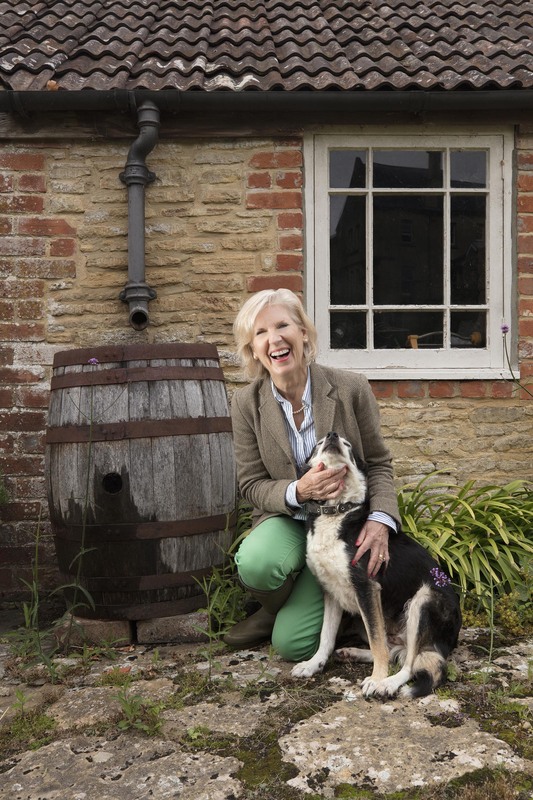 Jane prefers to allow her sheep live out their lives grazing on her 140 acre farm in Wiltshire. 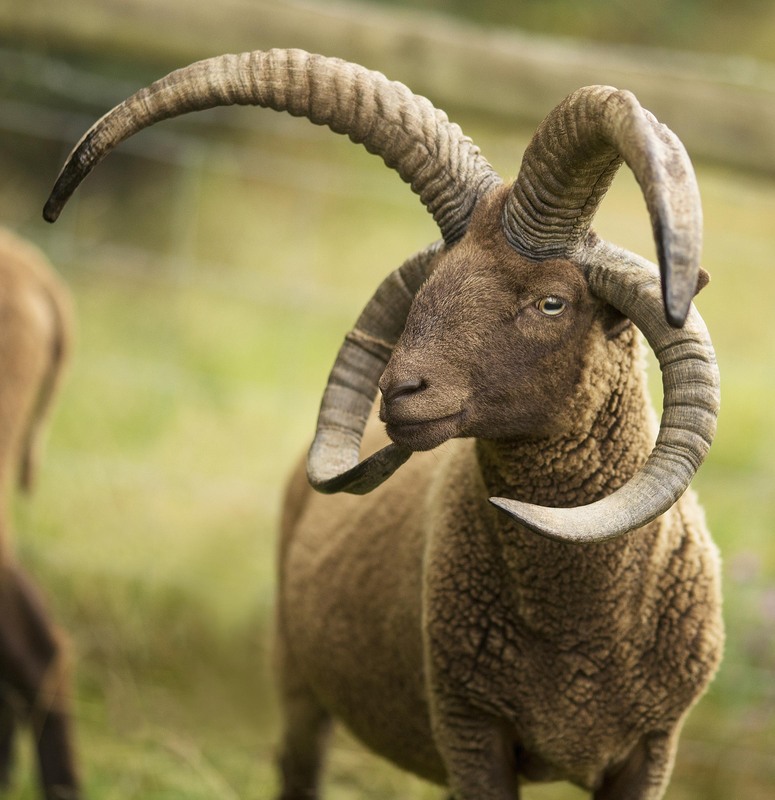 The Manx Loaghtan breed is not a common choice for most sheep farmers. The breed dates back to the pre-Viking days. Some of the rams even have four horns which makes like something that walked straight out of hell. 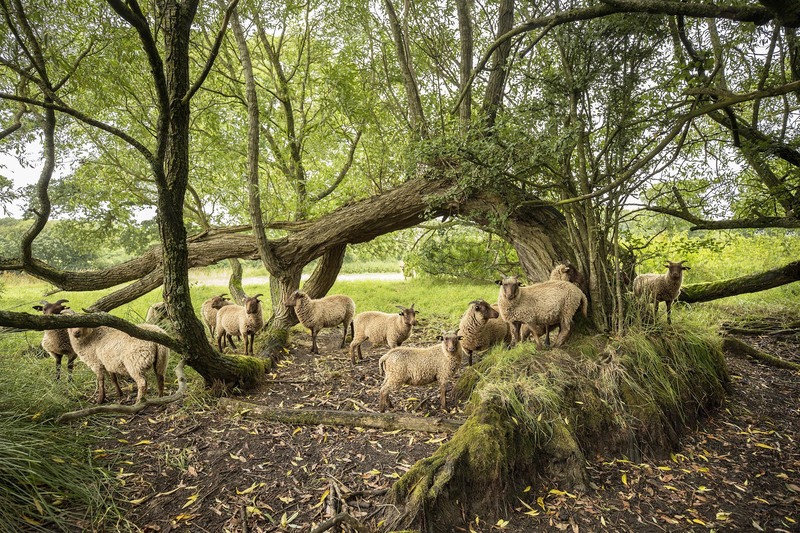 Some of Jane’s sheep find refuge in a shaded area located in one of the pastures. 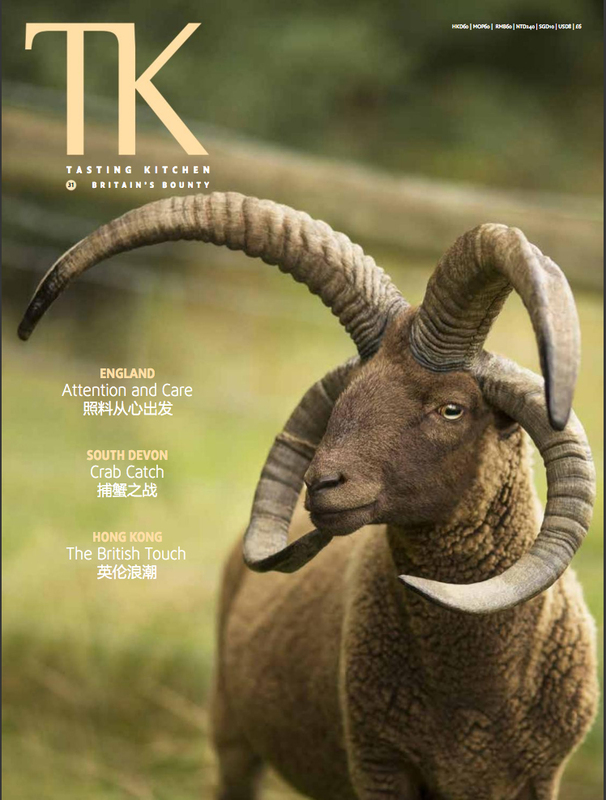 A Manx Loaghtan ram on the Langley Chase Organic Farm. It was a joy to watch the partnership between Jane and her 10-year-old border collie named Flute. It seemed that the two of them really loved herding sheep. Jane Kallaway, owner of Chase Langley Organic Farm and devoted partner, Flute. Paul Hayward, co-owner of Dingley Dell Pork, with one of his recently born piglets. Further down the road we stopped in at the Dingley Dell farm where we met up with Paul Hayward who co-owns the farm with his brother Mark. Their system for raising out the pigs runs contrary to most commercial operations. 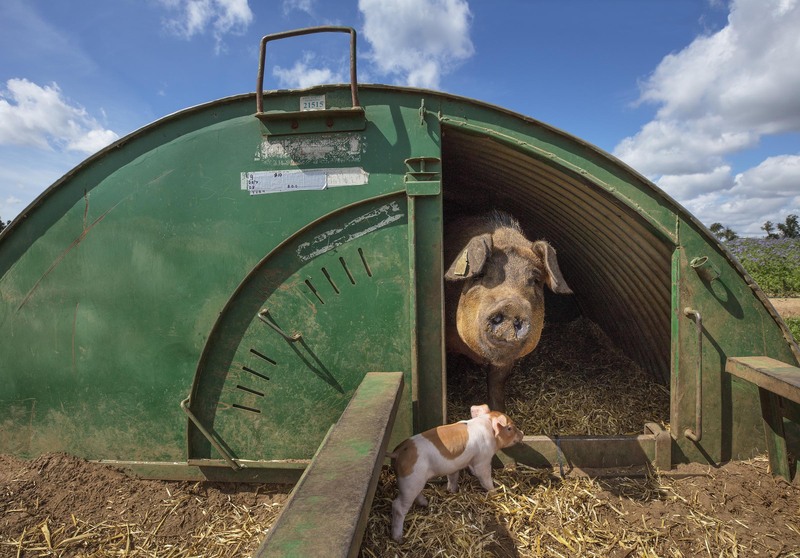 Rather than keeping the hogs penned up indoors on concrete floors they decided to allow the pigs to live out their entire lives in the great outdoors. 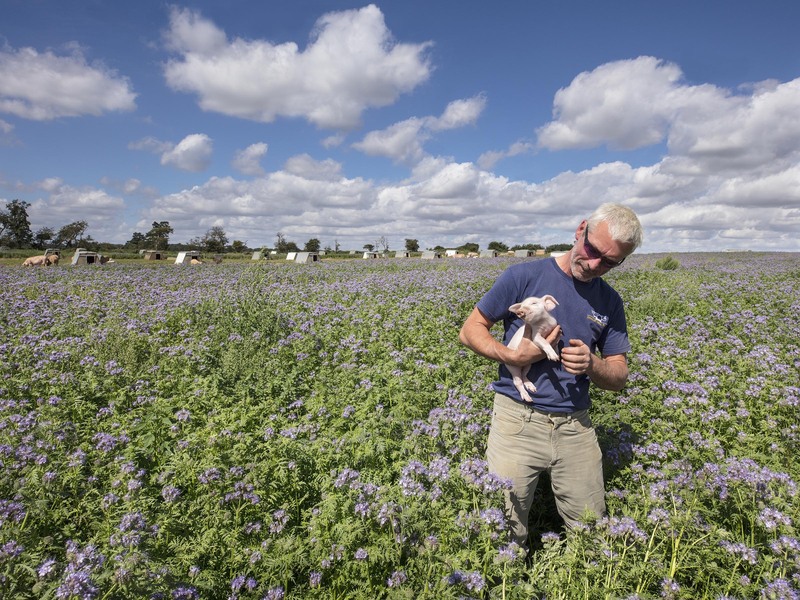 The piglets are allowed to roam freely through the fields which have been planted with a variety of wild flowers while the mother remains in a grassy compound kept in my a single electrified wire. Her area for roaming is significantly more than any commercial farm I’ve ever seen. 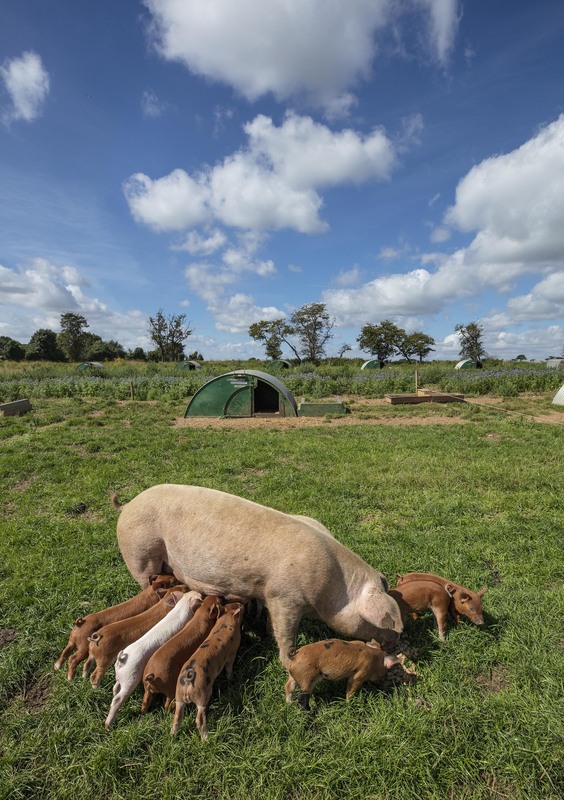 A sow and her piglets at the Dingley Dell Farm. 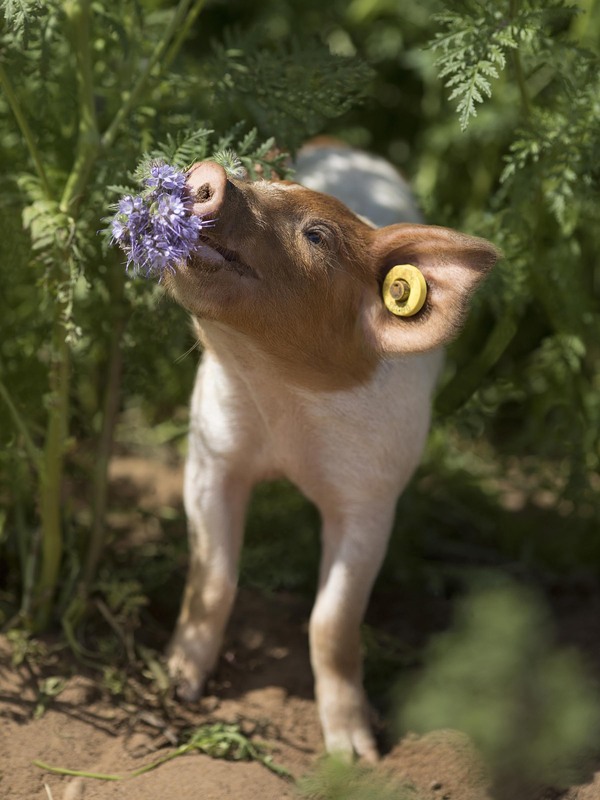 A piglet roams freely through the fields planted in flowers and other grasses at the Dingley Dell farm. While the piglets are allowed to roam free they never stray off to far from their mother. Each sow is provided with her own little condominium which serves to keep her cool in the summer and warm in the winter. 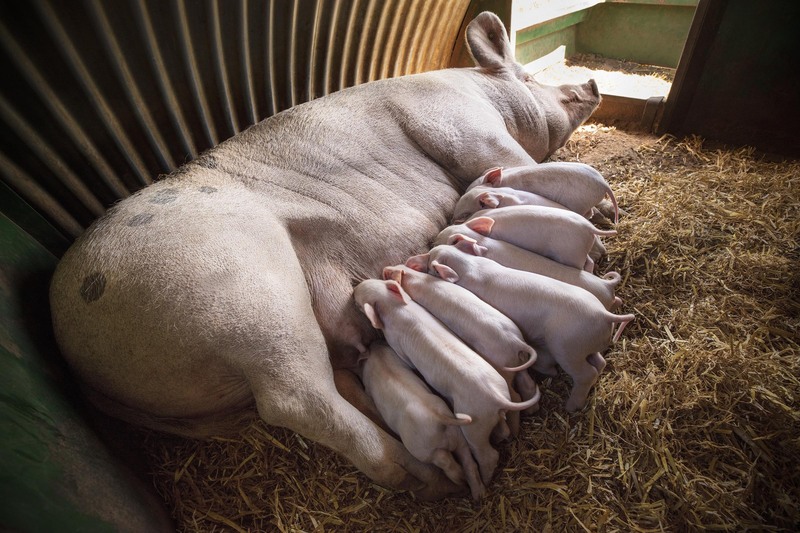 By keeping her comfortable the farmers have learned that her piglets are healthier and grow more rapidly. 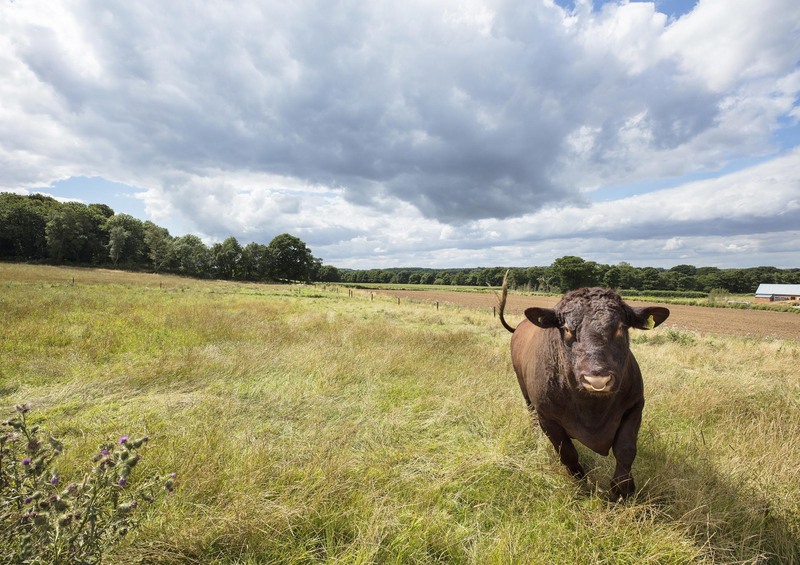 Not far away we stopped in at Yarn Hill Farm where Richard and Natasha Mann are raising a rare native breed of cattle known as the Lincoln Red. Like the Manx sheep these bovine date back to the pre-Viking invasion days. Their grass fed herd numbers more than 250 which includes five bulls and a 110 breeding cows. 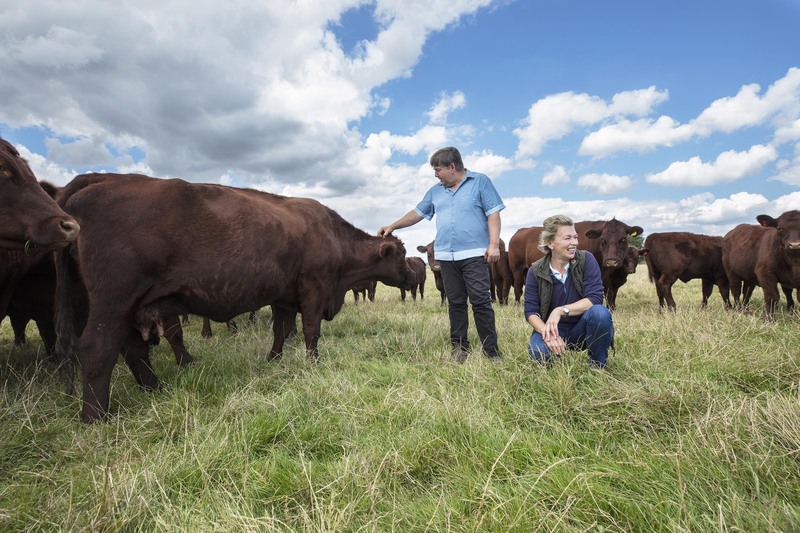 Richard and Natasha Mann with their Lincoln Red cattle. A close encounter with a Lincoln Red bull. It became quite clear that this guy did not like having his picture taken.